I was totally unprepared for how stunning the Gateway Arch is on a sunny day. The stainless steel shone brightly in the sunlight, sparks seeming to shoot from the angles as the sun hit them just right. I was happy just sitting beneath the arch enjoying the vertigo as I watched the clouds float swiftly past the peak. I admit to being clueless about the Arch. 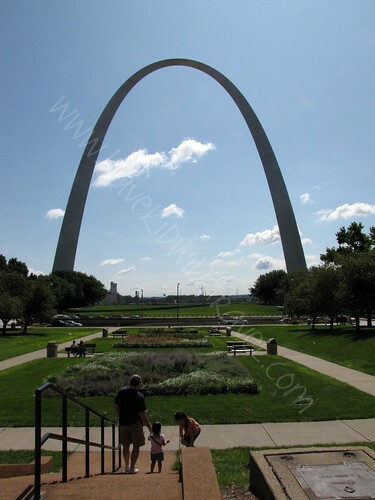 I had no idea that it was actually built as a memorial to commemorate St. Louis’ role in westward expansion. The park that surrounds it is huge with walking paths, lots of open green space and small lakes. The Arch is the highest national monument of its kind at 630 feet- taller than the Washington Monument (555 feet) and the Statue of Liberty (305 feet)- and can be seen for 30 miles. It is truly striking and we spent a lot of time just looking at it. To enter the Arch you approach either base. The north leg is always busier so I suggest heading to the south. 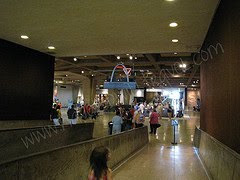 It is free to enter the Arch but be prepared for airport-style screening; all bags will go through an x-ray machine and belts, coins and other items must be removed from your person before going through the metal detector. Once below the Arch a huge expanse spreads before you. To one side is the ticket counter. Here you can buy tickets “to the top”, for river boat cruises or to see the documentary of the arch. On either side of the ticket counter is a store. 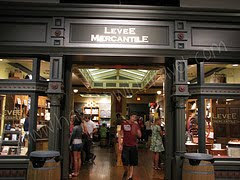 To the right is the Mercantile. While you won’t find bolts of calico or sacks of flour and sugar you will find sticks of candy, honey, handmade soaps and other “olden” goodies. To the left is the museum store with amazing Arch photos on everything from mugs to magnets as well as the de rigueur tshirts, puzzles, keychains and other novelties. Brenna chose a scale model of the Arch. Directly across from the ticket desk is the Museum of Western Expansion. The museum follows a circular pattern with areas very clearly marked. Begin by standing beside President Jefferson gazing westward. The Lewis and Clark Expedition comprises the outer ring that ends at the wall of American Indian Peace Medals. 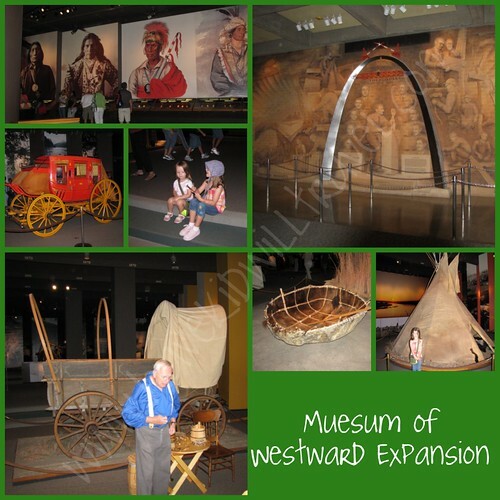 Inside you will see a tipi and bullboat, learn about the buffalo, explorers, cowboys, the railroad and everything else that took the United States past the Mississippi River. A tram ticket will cost $10 for adults and $5 for children ages 3-15. It’s really an interesting experience- even if you have a bit of hesitation about heights, like I do. The first area you enter gives the history of the arch. A bank of phones explains how the arch was built as images appear before you. 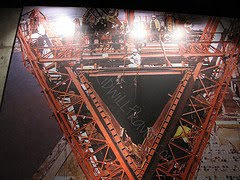 You are surrounded by images of the arch being built and have the opportunity to have a souvenir photo taken. The entries in the north and south leg do differ a bit with the south being a bit less stark once in the actual loading area. Once you enter the loading area it’s a tiny bit surreal. Almost 50’s sci-fi. You line up at your assigned door and wait for your “pod”. There are eight “pods”, each holding 5 people. It’s a very smooth ride and interesting as well, as each “pod” has windows so you can see the interior of the Arch. The ride up takes 4 minutes and the ride down takes 3. It’s rather surreal to walk the final steps to the top of the arch. The area is large enough for 200 people and, unless you are incredibly tall, you can stand straight in it. Of course most people are bent over, leaning against the ledge, peering out the window. And the view of downtown… Breathtaking. To truly “do the Arch” I would allow 3 hours; more if you like history as the museum is very interesting. If architecture is your thing be sure to check out the documentary of the building of the Arch. Having grown up on Mark Twain tales I have a fondness for riverboats. 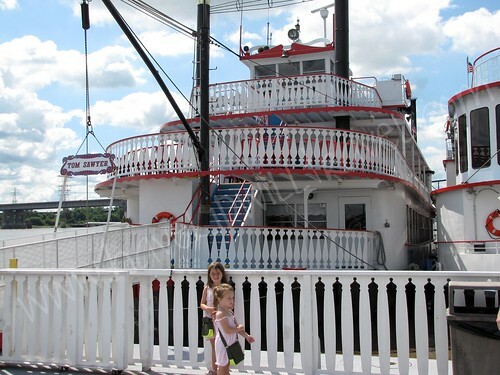 There are many types of cruises to choose from; dinner and brunch cruises, blues cruises, lock & dam cruises and the one hour sightseeing cruise, which is what we did. Prices range from $14 for adults, $8 for children for the one hour cruise to $52 for an adult dinner cruise. You can buy your tickets at the Arch or at the riverfront. 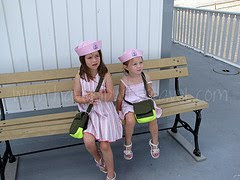 We got ours at the riverfront and the girls bought sailor hats ($5) in anticipation of their first cruise. The boats are large replicas of early 19th century steamboats. We boarded the Tom Sawyer. The other riverboat, in sticking to theme, is the Becky Thatcher. We had a fine day for a cruise; the Arch is incredible when seen from the river. We had both the riverboat captain and a park ranger from the Jefferson National Expansion Memorial serve as our guides, each sharing information about sites along the river. The second photo in my collage is the Captain’s Return statue (Lewis,Clark & Seaman) by Harry Weber. It sits at the edge of the Mississippi and is in sight of William Clark’s house. The third shot is the President’s Casino- built on an actual riverboat. The boat itself has an amazing history beginning in 1907 as a side-wheeled steamboat, being remodeled in 1940 to an art-deco excursion riverboat and then becoming a nightclub in 1979 before being purchased, restored and becoming the President’s Casino on the Admiral. The riverboat has a snack counter on board. If you need more sustenance casual dining options are available at the Arch View Cafe, near where you board the boat, and can be taken on board the cruise. 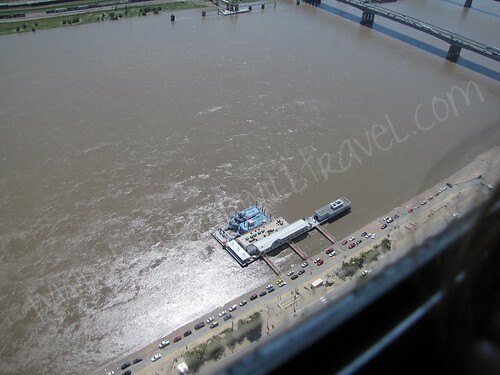 If a riverboat tour isn’t your idea of fun you may be interested in the helicopter tours nearby. 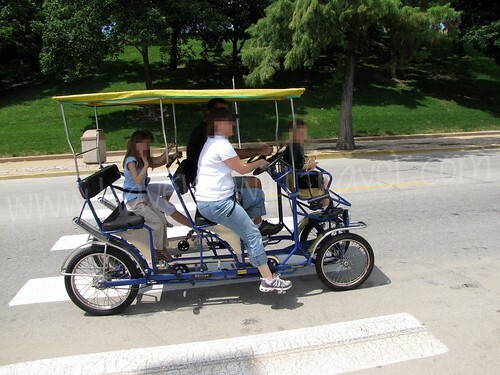 If we would have had more time I would have loved to rent a quad bike which can seat 4-6 people and has up-front seating for little ones. It just looked like fun! 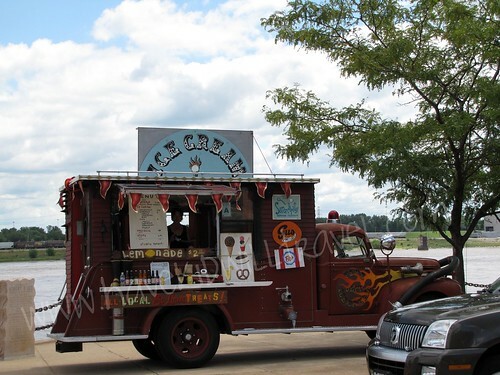 If you get hot or thirsty look for this distinctive ice cream truck. 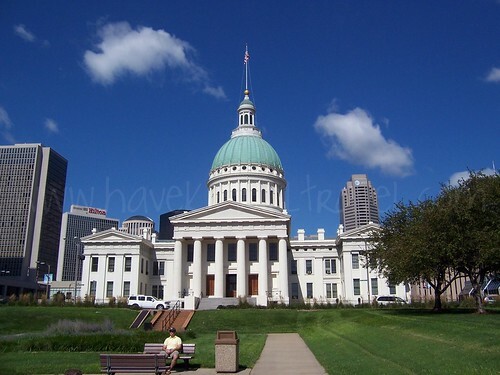 In 1846 Dred Scott, a slave, and his wife Harriet sued for, and won, their freedom in this St. Louis courthouse. The US Supreme Court later overturned that decision which helped to hasten the beginning of the civil war. Virginia Minor also had a rather significant case here dealing with the womens suffrage movement in 1872. 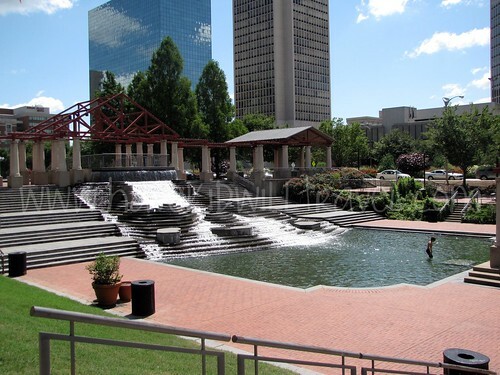 Directly behind the Old Courthouse is Kiener Plaza and amphitheater. Many city events take place here but the day we discovered it all was quiet and children were playing in the waterfall and pool. St. Louis surprised us with all it has to offer- and we didn’t do as much as we would have liked to. It’s a great family destination. Beautiful photos! I am originally from St. Louis now living in Florida and this post makes me miss my home town even more! 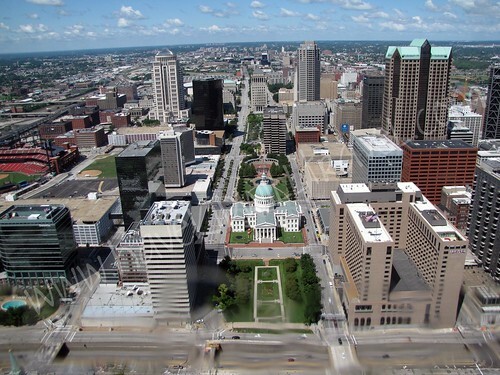 St. Louis is an amazing place to visit, lots of free things to do! 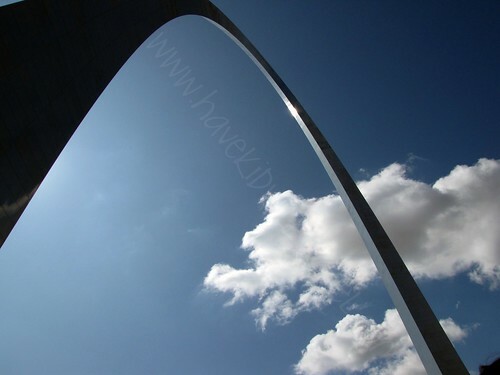 Its April 2015 and reading this 2009 blog simply seems timeless …as if it were just the other day… Seeing and going up to the top of the Arch is one of my personal bucket-list adventures… ( my husband and kids will be in-tow) I am not originally from here, so the iconic and historical landmarks of the USA are most appealing to me. Thanks for the traveling with children site… I will check more of it out…. We are heading to Missouri in 3 weeks time…. so excited! Dee – thank you for such kind words! I am so glad this post was helpful as you look forward to your St. Louis vacation! 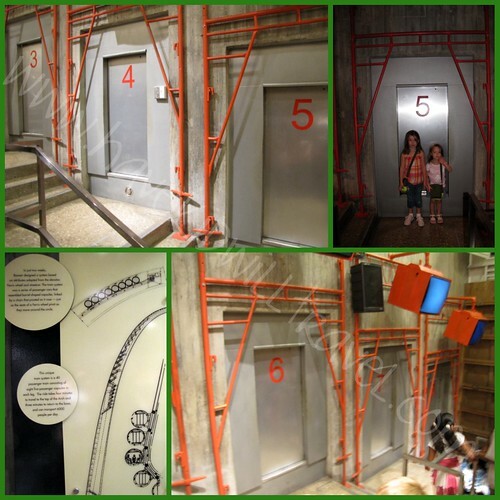 Please check out my other posts from St. Louis – and have a wonderful trip!